Global presence is an important part of the food trade industry. It means staying abreast of trends, culture, news, and products…continuously, reliably, and accurately. It means having local presence yet global knowledge. It means Interra International. In-Terra…of the Land. At Interra International, our multi-national, multi-lingual staff of professionals works hard to connect producers and processors to distributors and wholesalers around the globe. Our diverse cultural background in combination with our corporate family culture is what makes Interra International the right choice as your global food trade partner. In 2015, we welcomed an affiliation with Seaboard Corporation, increasing our product offerings. Find a location and connect with our specialists. This map shows a sampling of our locations. We sell over 4,300 products from 45 source countries into over 95 destination countries. 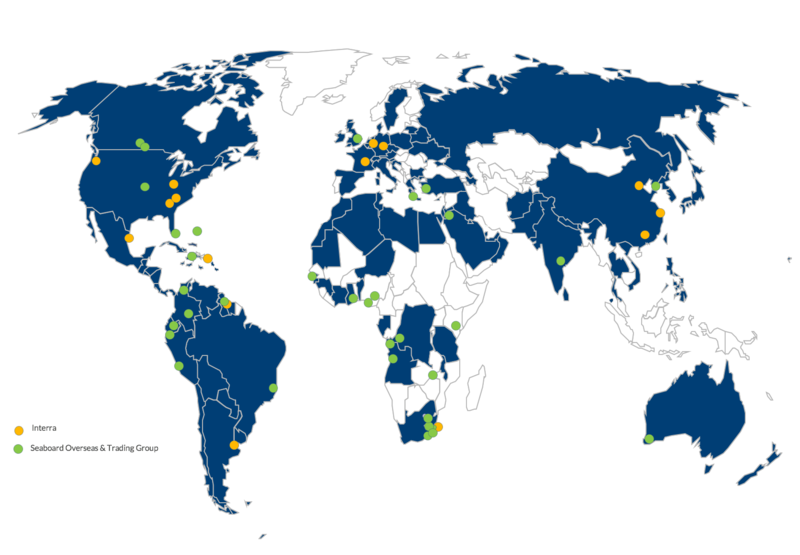 Not all geographic locations in which Interra International and Seaboard have operations are shown.